Last night Ryan and I skipped the yoga work out from p90x and ran around the outer loop at Lake Eola instead. After 2 laps (approx. 2.2 miles) we decided to call it a day since the humidity was at an all time high and the rain clouds were looming overhead. After showering we headed to Tijuana Flat's for dinner and trivia. I left trivia after round 1 to drive over to Sunny's new apartment. She was hosting a girls craft/wine night and I jumped at the chance to hang out. Her new place is awesome and decorated really nicely. I had a good time meeting some of her girlfriends and drinking their wine and eating all of the baked brie. 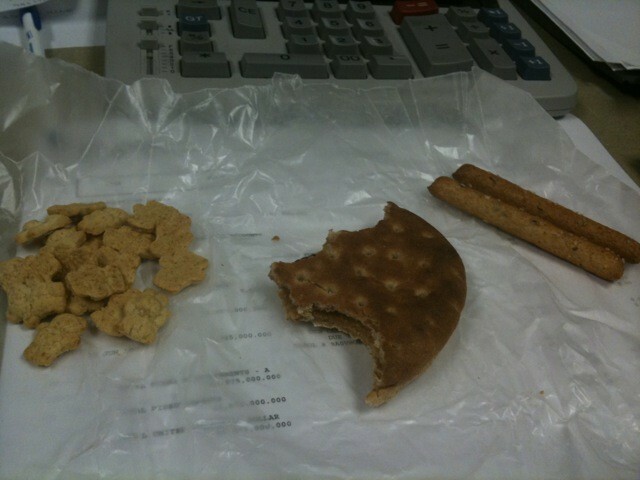 Usually I stick to the usual (but ultimately boring) peanut butter and jelly sandwich for lunch. On days that I am lucky enough to have leftovers from the night before I get really excited. So excited in fact that I use my camera phone to take pictures for my blog. Entrees from restaurants usually equal 2 meals for someone who is Jess sized. That makes me a cheap 2 dates, or so Ryan tells me. Actually old money bags would rather me not save the food for lunch the next day, and instead would prefer to eat it himself after finishing off his entire meal. Before I got to eat a delicious dinner with my beautiful friend, I had to work out. It was p90x day 59 and the work out on the menu was shoulders, arms, and ab ripper. Working out for over an hour is never fun but the series of exercises in last night's work out made the time seem to fly by. The series included various shoulder exercises, followed by biceps, then ending with triceps, then repeat all 3 exercises before taking a 30 second break. There were shoulder presses, bicep concentration curls, tricep kickbacks, dips, upright row, more types of biceps curls, all done using 5-10 pound weights for at least 12 reps, going up to 16 reps in some of the exercises. Needless to say my arms were definitely tired by the time the ab ripper work out started. Gotta love getting a full ab work out done in under 15 minutes. After we were done it was time to shower and head out the door for my dinner date with Meghan. I met her at Chai Thai on Orange Ave. She ordered the green curry with tofu and I went with my usual order of pad thai with tofu. The wine selection was lacking so I opted for a Singha beer. The beer was a cold and refreshing treat alongside my spicy noodles. 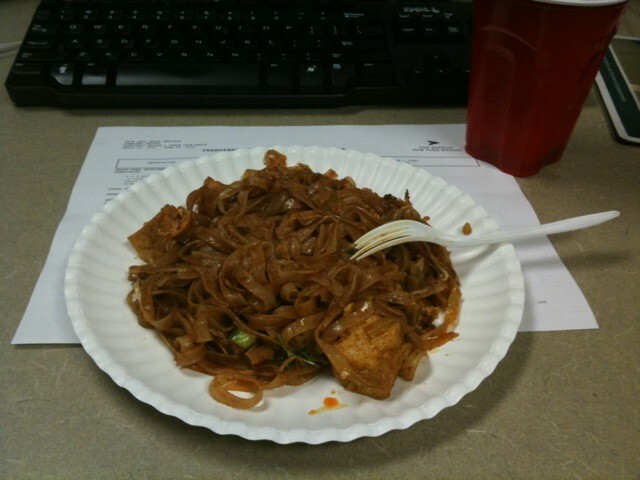 Although pad thai is usually mild, I had requested a side of spicy sauce to add to my dish. Lucky for me the portion of the entree was large enough to split for dinner and lunch today. It was an evening full of tasty food, cold beer, and friendly conversation with one of my favorite people. The past 2 days have been filled with cardiovascular exercise. Since we had done the back/chest work out on sunday night, monday was a free day from p90x. I headed down to our gym and cycled for 32 minutes (11.62 miles) then did an easy 10 minutes on the elliptical for 0.75 miles. Not a bad way to spend 42 minutes of the day. Today I did a lot more walking than normal. After using MapMyRun I was able to figure out approximately how many miles I walked today. I had a dentist appointment today and walked to and from there from my apartment. Total miles walked on that journey was 0.6 miles and a good bill of health for my toothers. Once I got home I caught up with Katie for a bit and then headed down to the gym to run a couple of miles on the treadmill. I rushed back home and showered up before meeting Chris at Cityfish for free oyster night. I ate way too many raw oysters (didn't reach 2 dozen this time) and then ordered some fish tacos off their happy hour menu. Delicious meal! Ever wonder how many calories were in raw oysters? According to an article from ehow there are 243 calories in one half dozen raw oysters. I'm pretty sure I ate at least a dozen, probably closer to 15. There goes having a low calorie meal tonight. After running the 5k on Thursday night Ryan and I were pretty much "anti doing anything athletic" on Friday. We had both left work early in the day to begin our journey to Jacksonville. We had dinner with friends Jane and Pepi at the new house (they recently moved to Jacksonville from Jupiter). After our delicious meal of salmon, asparagus, and rice, we headed over to Alex's house where we were spending the night. Saturday morning Ryan and I managed to get out of bed and head out for a very hot and muggy run. We only managed to do 2 miles in 20 minutes, but something is always better than nothing. After we showered and packed up our things we headed to the Original Pancake House to have breakfast with Alex before we left for St. Augustine. I had an egg cooked over easy, 2 pieces of turkey sausage, and 1 piece of wheat toast, along with copious amounts of coffee. The drive to St. Augustine was relatively short and we managed to get to our hotel, the Casa Monica, around noon. Our room wasn't ready yet but luckily we had worn our bathing suits and were able to head straight to the pool. We lounged in the sun for a couple of hours before it was time to start getting ready for Danielle and Billy's wedding. The wedding was a lot of fun and we had a good time hanging out with a bunch of my sorority sisters and their husbands. We managed to make it out after the wedding to a couple of local bars. After a lot of drinking, dancing, and laughing it was time to call it a night. Sunday morning we woke up and packed up our things and checked out of the hotel just before 11am. We had driven by a diner on our way into town and decided to hit it up on our way out of town. Georgie's Diner was just what we needed after too much fun the night before. I love breakfast more than any other meal and jumped at the chance to order eggs, hash browns, and bacon. I ate everything on my plate (except for the 2nd piece of toast) and felt completely satisfied. We hit up some of the outlet stores in St. Augustine and then started our drive home (after a couple of thrifty purchases of course). Halfway through the drive Ryan got hungry again and we stopped for lunch at Subway's. I opted for a 6 inch veggie on 9 grain wheat bread with provolone cheese, spinach, red onions, black olives, and honey mustard sauce. Along with my sub I tried a bag of Baked Lay's potato chips in their new flavor, Parmesan and Tuscan herb. They were by far the best nutritional choice of potato chips with only 120 calories and 3 grams of fat, compared to over 200 calories for the bag of Sun Chips I had my eye on. After meeting up with my parents somewhere near Geneva we picked up Honey and headed home. We lounged around on the couches for a couple of hours and then motivated ourselves to do the back and chest workout for p90x, followed by the ab ripper X segment. I'm really happy that we made ourselves work out even though we were so tired from the weekend. We rewarded ourselves with some burgers from Johnny's Fillin' Station. I look down at the clock on my computer, notice it's almost 11am, and realize I haven't had breakfast yet. Do you ever eat such a late or filling dinner that makes you feel full the next morning? I guess my cheeseburger from Johnny's Fillin' Station last night did the trick. Since Ryan is out of town for the next couple of days I decided to bring a box of cereal and carton of soy milk to work instead of making breakfast at home for 1. I usually get out of making any adult meals while he's gone since I'm satisfied with mac and cheese, frozen chicken nuggets, and cereal for most of my meals. 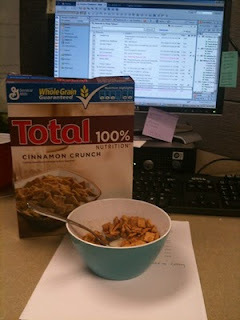 Total's Cinnamon Crunch Cereal is actually one of my favorite cereals out on the shelves. It reminds me of Cinnamon Toast Crunch without being as sugary and with way more nutritional value. Check out their website for a $1 off coupon. 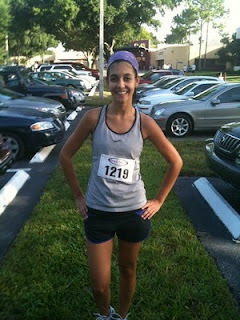 Last night was the JCC Beat the Heat 5k in Maitland. The race started at 7pm but it was still really hot and muggy. The start and finish of the course was at the JCC on N. Maitland Ave. and went through the neighborhood surrounding Lake Sybelia. Although the event details claimed the course was flat there were definitely a lot of uphill parts of the race, especially a tough hill around the 2.5 mile mark. Track Shack was in charge of timing the race and seemed to be pretty organized like usual except for the start of the race. We had to wait for the cops to stop traffic on N. Maitland Ave. and for the Track Shack employees to run into the road and set up the timing equipment right before we actually began. We were running on the actual road until we made our first turn into the nearby neighborhood. I had decided to run without my Garmin 305 and figured I would just enjoy the evening run and listen to my music worry free. Well I made the mistake of not checking my i-Pod shuffle beforehand and realized the battery was completely dead while at the starting line. I hate running without music since I can hear myself and those around me breathing and it seems to throw me off. Somehow I managed to calm my breathing down throughout the race and just concentrated on finishing. I finished mile 1 in 8:10 minutes. I realized I was probably running too fast and should have slowed down but I continued at this pace and finished mile 2 at 16:10 minutes. I was excited about my negative split and really thought there was a chance to PR this race (my best 5k time is 25:31). The last mile of the race was tough and my legs were really starting to get heavy. I pushed on and finished mile 3 in 24:55 minutes. I tried to sprint during the last 0.1 miles but ended up finishing with an official time of 25:49 minutes. I might not have PR'd but I definitely tried my best and considering the hills, the warm temperatures, and lack of music, I think I did pretty well. I don't think Honey has made her debut yet on this site so I wanted to post a little something about her. We've had her for a year now and have loved every minute of being her owners ... ok so maybe not EVERY minute since there were definitely times I had to clean up her pee or poop. For the most part she's a doll and acts like a little mini human. 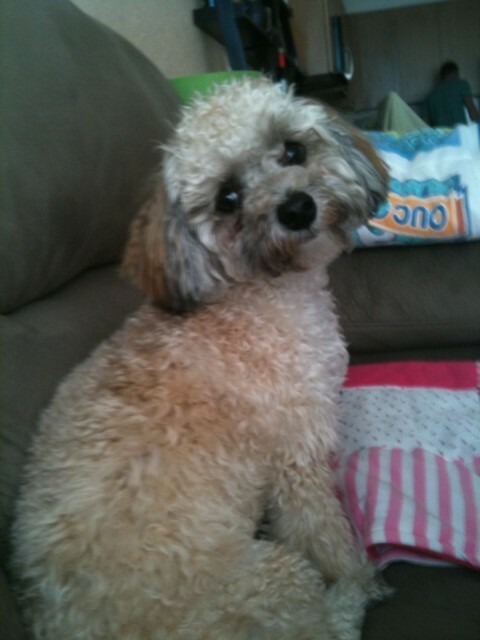 She's my buddy when Ryan is out of town and keeps me company when I'm scared of being home alone. I looked forward to not having to cook a full meal after I was done working out yesterday. Ryan and I did p90x day 51, core synergistics. I actually hate this work out quite a bit. It's a lot of push-ups and squats and lunges. Oh and these silly things called the banana where you lay on your back, stomach, and each side in the shape of a banana to work out your core. Lame. We're supposed to do the core synergistics work out 3 more times during the last 5 weeks of the program. I guess I'll get through it. -Preheat broiler. Place zucchini lengths on lightly greased baking sheet and heat until browned. Cool slightly. -Mix 1 egg with ricotta cheese. Season mixture with garlic powder and chili flakes. -Coat bottom of casserole dish with tomato sauce, cover with layer of zucchini, mushrooms, and basil, season with salt and pepper, and follow with a layer of ricotta mixture and mozzarella cheese. Repeat. -Top with more tomato sauce, mozzarella and Parmesan cheeses. -Place in preheated 375 degree oven and bake for 30 minutes. -Cool slightly and cut into squares. I had to quickly write about my lunch today since it made me chuckle while in my cubicle. Oh and yes I realize its past 2pm and is too late to being having lunch. I ate most of my peanut butter and raspberry jelly sandwich before I took this picture. 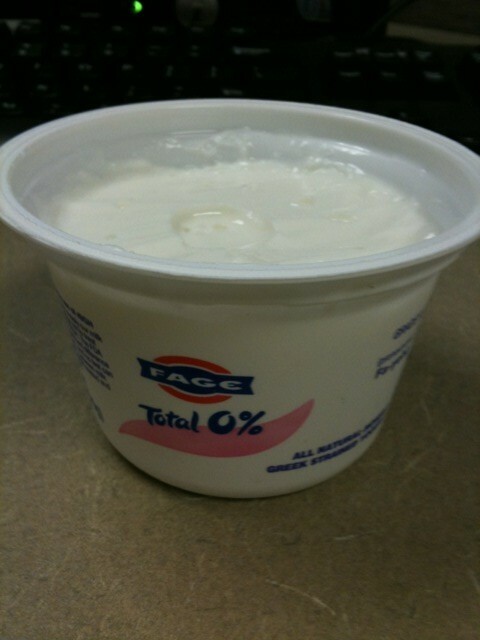 I swear I can afford to have a whole sandwich every day for lunch. Along with my pb&j sandwich I had 1/2 serving size of mini Teddy Grahams "Honey" ... in cute little bear cub shapes hehehe. These pretzels are pretty tasty and have all sorts of yummy organic products ... whole wheat, oats, rye, barley, buckwheat, whole brown rice, whole corn, millet, flax seeds, sesame seeds, and quinoa. 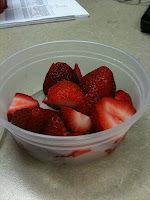 It goes to show you that you can still have a fun lunch from your childhood while still being healthy! Ok so maybe not the full 48 hours of the weekend was spent having fun in the sun ... part of that time we spent sleeping. Ah yes sleeping. Ryan and I actually slept in both Saturday and Sunday (well if you don't count waking up at 6:30 to take Honey "I have the world's smallest dog bladder" outside and then coming back to bed). We managed to pull ourselves out of our semi-comfortable bed around 10am on Saturday and decided on our game plan for the day. We would eat breakfast (I made egg whites, Canadian bacon, and a blueberry/banana smoothie) and then head off to the Winter Park Country Club to play some golf. We made it to the golf course around 11:45am and started our 9 hole game. We are such bad golfers that we even forgot to get scorecards to keep track of our terrible scores (shucks). The walking 9 holes are situated in historic downtown Winter Park. Some of the holes are even next to the local cemetery ... spooky! After chugging liters of water we managed to sweat through the entire course in 2 hours. By this point we were starving and headed over to 4 Rivers Smokehouse for some lunch. This place was packed! It seemed everyone wanted some delicious BBQ lunch around 2pm on Saturday afternoon. The line didn't stop us from (im)patiently waiting to order and take home some really good food. We both got the brisket sandwich with 2 sides; I chose macaroni and cheese and their BBQ beans and Ryan got the fried pickles and potato salad. Along with this we ordered a piece of cornbread and biscuit AND a slice of pecan pie. Oh and naturally we ordered 2 sweet iced teas. All of the food was delicious! It was definitely the best BBQ I've eaten in central Florida and would go back there in the future (except this time I would call in my order first and avoid waiting in line). The rest of the afternoon is pretty hazy ... I think Ryan and I passed out from a food coma. We managed to pull ourselves out of said coma and met up with Chris at Mucho's for some margaritas and chips and salsa. Ole! Although we didn't have any real exercise on Saturday, I'd like to think walking around the golf course pulling a cart that held my golf bag was a great work out. Regardless it was time to have some real exercise after skipping our kenpo work out for p90x on Saturday. Sunday morning Ryan and I got a late start on our run (probably because I didn't want to get out of bed), but still managed to get out to Lake Eola by 9:45am. We ran 2 outer loops (close to 2.25 miles) at a pretty decent pace. Then we went to Publix to buy some subs for lunch and did some grocery shopping. After we ate lunch (at this point we were famished since we had skipped breakfast) we headed down to the pool to enjoy some of the gorgeous weather. Our pool time was cut short since we were heading over to Winter Park Village with Chris to see "Inception." Wow, what a crazy movie. I really had to focus on what was going on and think about what I was seeing. Really good movie but definitely need to see it again to really grasp all of the concepts. For dinner I made ground beef with dried fruit (apricots, craisins, golden raisins) and olives, seasoned with cinnamon, paprika, cumin, and garlic salt, on top of brown rice. On the side we had a spinach salad with cherry tomatoes and baby bella mushrooms. It was fast and easy to make plus very delicious. All in all it was an active weekend spent both outdoors and indoors, with some exercise mixed in. After running 12 miles in 2 days my legs were really feeling tired. I was not looking forward to working out back and legs but somehow managed to pull through and even used weights for some of the lunges, squats, and calves. We also had to do the 15 minutes of ab exercises once we were done. Once the work out was over it was time for getting showered up and ready for our date. We made it in time for our 7:45pm reservation. We ordered some appetizers (hummus and some Greek yogurt, dill, mint, walnut dip) and split an entree (grilled lamb with rice and vegetables). All of the food was really good and of course we didn't have any room left for dessert (boo). We headed over to another restaurant near Park Ave. for drinks with Katie and her boyfriend Chris and Meghan and her boyfriend Ken. Triple date! Ryan and I split a bottle of red Chilean wine and were feeling pretty tipsy by the time everyone was ready to leave. Lucky for me Ryan drank less than I did (or holds his alcohol better) and we made it home safe and sound. After working out back, biceps, and abs we were half way done with the program. Once we were done, it was time to have our usual post work out protein shakes. Instead of using fresh spinach like we usually do, I decided to use fresh kale. They were terrible. I'm not really sure what eating fresh cut grass tastes like, but I'm fairly certain it tastes very similar to kale protein shakes. We chugged them down (somehow) and headed to Tijuana Flats for some dinner. I think I'll stick to using fresh spinach since somehow that flavor is always masked by the peanut butter and banana. Today was supposed to be yoga day. Although I usually enjoy the 90 minutes of stretching and balancing I decided to run for 60 minutes on the treadmill instead. I decided to keep dinner simple and made brown rice, grilled chicken, a mushroom and tomato salad, and ... kale chips! Using the recipe from Ashley's blog I was able to make delicious, crispy chips that are very healthy for you. Directions: Preheat the oven to 350F. Take several kale leaves, wash, and rip off the leaves and place on baking sheet. Toss the stems. Rip into small pieces about 3 inches in length. Drizzle extra virgin olive oil over top and then sprinkle salt and ground black pepper over top. Bake for 10-15 minutes and then remove from the oven and flip, and then bake for another 10-15 minutes until very crispy. Ryan and I really liked how the chips tasted and will definitely be making them again (especially since we have so much left in the crisper of our refrigerator). Not too bad of a substitute work out for p90x day 44. Once I was done running I realized that I had not eaten nearly enough today for the amount of calories I burned, ie. I was famished at this point. Luckily I had plenty of leftovers from last night. What makes leftovers taste even better? Wine! A glass of chilled Chilean La Playa sauvignon blanc definitely helped in relaxing me. I only had to worry about feeding myself tonight (oh and pouring some dog food into Honey's bowl) since Ryan won't be back until tomorrow. The leftover "paella" was even better today. I added some Goya hot sauce to the rice and shrimp to add some spice. On the side I microwaved some frozen sweet plantains (found in the freezer section of Sedano's grocery store) and chopped up some tomatoes and cucumbers and mixed the veggies with some goat cheese, dried basil, and balsamic vinegar for a simple salad. Although the dinner was tasty I missed the company of OMC. 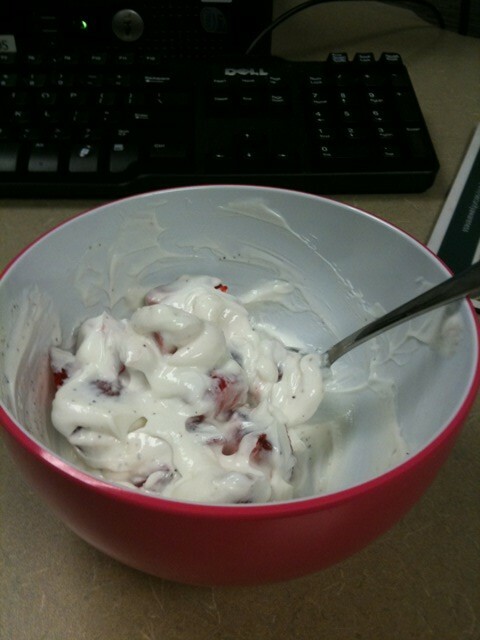 strawberries + yogurt = delicious afternoon snack! 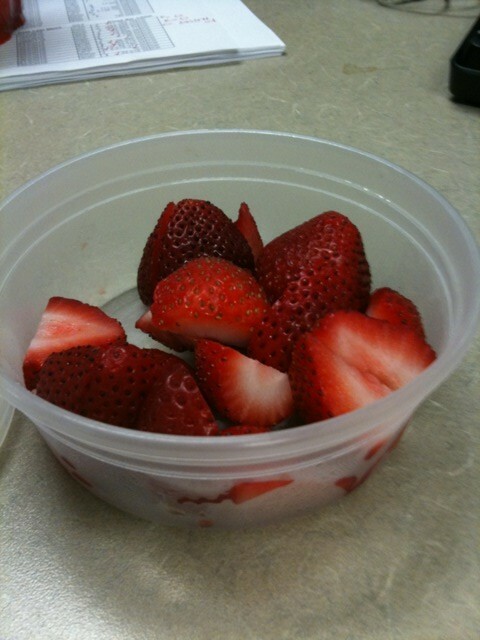 Hopefully this treat will give me enough energy to power through a long run today after work. Ryan left this morning for Richmond, Va and took the plyometrics DVD with him. I'm looking forward to really pushing myself today to make up for the lack of cardio during the weekend. Might be a treadmill day if the rain clouds make it over to downtown before I get a chance to run. Seriously I don't understand why my blog is blocked some days on my work computer and other days it is not. Today it is not blocked (yes I check everyday ... no I'm not my own biggest stalker) so I decided to jump on the chance at recapping the past couple of days. Today's work out was supposed to be plyometrics but Ryan wasn't feeling all of the jumping around so we opted for Wednesday's work out instead, back and biceps. I was able to use 10 pound weights for some of the bicep exercises which made me happy to see such an improvement. Out of the 6 pull up exercises I was able to do 4 with Ryan's assistance. All-in-all it was a really good work out that left us tired and on the brink of soreness. Our reward for working out so hard was walking over to Dexter's for $1 burger night. We took a seat at the bar (no alcohol for us) and ordered iced teas, burgers, and a basket of french fries to split. Even though each burger is 1/4 pound I ordered 2 knowing I wouldn't finish both but would leave the rest for Ryan to devour. After tax and tip our bill was roughly $20 ... gotta love cheap(ish) meals. The walk to and from the restaurant totalled over 1.5 miles which added to exercise for the day. We did plyometrics today and I remembered why I hated this work out so much. It involves so many lunges, squats, and jumping around. Way too high impact for my liking, plus it really tweaks out my knees. After sweating and cursing at the television for an hour we did the ab work out. Tonight's dinner was roasted chicken thighs, seasoned with salt, pepper, and cinnamon, and whole wheat couscous, with cinnamon, dried cranberries, and golden raisins mixed in. On the side I made "tostones", fried, flattened plantains. Such a delicious meal. I was excited to use my cast iron pan that allowed me to brown the chicken thighs on the stove top before transferring it into the stove for further cooking. I was too lazy to really think of anything exciting for dinner so we popped in a frozen pizza into the oven. We tried the white pizza by California Pizza Kitchen. It was pretty good and I think we would buy it again assuming I either had another coupon for it or it was on sale (kind of costly for a frozen pizza). I spent the rest of the night downloading wedding pictures to Snapfish so hopefully I'll be done with that project in the next couple of days. On Friday we were released from work at 3:00pm. Ha it sounds like we're prisoners (sometimes I feel we are). I headed home to do the P90X legs/back work out with Ryan. Once we were done with 60 minutes of working out we decided to postpone the abs workout until the next day (sadly we never did get around to doing the 15 minute work out at all). It was great having free weights to use during squats and calf raises. Ryan is convinced I'm still improving on pull ups but as of now I have not been able to do one without his assistance. We quickly showered and got ready for dinner and met Tonio, his lovely lady friend Christina, and her roommate Tim, at Shari for delicious happy hour sushi. After a couple of Kirin Lights and some hot sake we were all definitely feeling a little buzzed. We decided to continue our night (ha or late evening, it was still pretty early by this time) at Stardust, a basement bar a few blocks away. Yes ... basement in Florida. I'm shocked as well. We downed a drink and then proceeded to Cleo's (another local bar). Why stop the barhopping? After one drink at Cleo's we headed to Bullitt Bar. This was a terrible idea. We drank stiff drinks and had some shots (both terrible ideas). Somehow Ryan and I made the executive decision to leave around midnight, grab some slices of pizza, and head home. The whiskey made Ryan a little crazy but somehow I managed to get him to stop eating all of the food in our house and head to bed. On Saturday we were not feeling all that motivated to do much of anything but we had promised our little Honey Bear (dog) that we would take her to the dog park. We got our butts into gear and headed out for the day. After racing to ChikFila we managed to make it with minutes to spare before the end of breakfast. Greasy food = hangover cure. At the dog park Honey made it a point to not hang out with any of the dogs and just stick by the people. We had a good group of friends there ... Chad and Brittany brought their bulldog Biscuit, Katie brought Emma her shitzu yorkie mix, and her roommate Carrie brought her large mutt Brady (I mean that with love!). After a while we decided it was time to head home and looked forward to some lounging on the couch. Saturday night we went to our first Predators game at the Amway Arena. Our friends Mike and Chris joined us since we were playing the Cleveland Gladiators (where they are both from). I'm still not sure which team ended up winning since we left around the 4th quarter while they were tied and headed to Finnhenry's pub. After a pint of some very dark Brooklyn Brown Ale Ryan and I made the right choice and called it a night. Sunday morning we woke up and decided to skip plyometrics (our work out from Saturday that we did not end up doing) and headed out for a run. We managed to run 2 outer loops around Lake Eola which is around 2.25 miles (no stopping, just straight running). After that we spent the rest of the morning getting ready for 4th of July festivities. I made some buffalo chicken dip, homemade guacamole, and had hummus and fresh fruit for our guests. It was quite the tasty spread of treats. Carrie and Katie came over during the afternoon and tried to enjoy the pool area with us but the rain sent us back indoors. Sunny and a couple of her friends showed up later in the evening, just in time for cheeseburgers and hot dogs. Around 8:30pm we headed down to the 7th floor in preparation of the fireworks show at Lake Eola. A drizzle of rain continued but at least we got to see some fireworks. Yesterday morning we woke up pretty early and headed to the dealership to drop off my car for some maintenance. We then picked up some Einstein's bagel sandwiches for breakfast and headed home. The rest of the day was spent watching season 1 of Breaking Bad (series on AMC). I got the call from the dealership to pick up my car around 3pm and finally found some motivation to work out once we got back home. Day 36 of P90X was chest, shoulders, triceps and the ab work out. I still hate doing all of the push-ups but am slowly getting better at them. It was so much easier doing the shoulder and triceps exercises with free weights. After we were done with our work out I made us some green monster smoothies (spinach, water, frozen banana, protein powder, and peanut butter) to hold us over until dinner. For dinner I made pork chops with BBQ sauce, baked beans (left over from Sunday), cheesy grits (I'm a southern girl), and tomato/cucumber salad. For dessert we had tiny pieces of leftover apple pie from Sunday. What a loooooooong 3 day weekend! Yesterday after work I did 90 minutes of yoga which is Day 32 of P90X. It's nice to see we are finally 1/3 of the way through this program. I made myself an 8 year old's dinner once I was finished ... baked sweet potato fries, chicken nuggets, all washed down with a glass of chocolate milk. What can I say? I like simple meals, especially when I'm only cooking for 1 person (Ryan met up with Chris and Bree at Tijuana Flats for trivia). This morning I woke up at 6:15am, took Honey on her morning walk, and came back inside ready to work out biceps and back (from day 31). I did most of the work out except for the 6 pull-up exercises (I can't do pull-ups without Ryan's assistance, plus we're doing legs/back tonight). The other 18 exercises included mostly bicep exercises except for a few rowing/type back exercises. All were done with my 5 pound free weights instead of the resistance bands. I hope Ryan remembers to buy more free weights today so I can use the 10 pound weights next time. I am one buff girl! 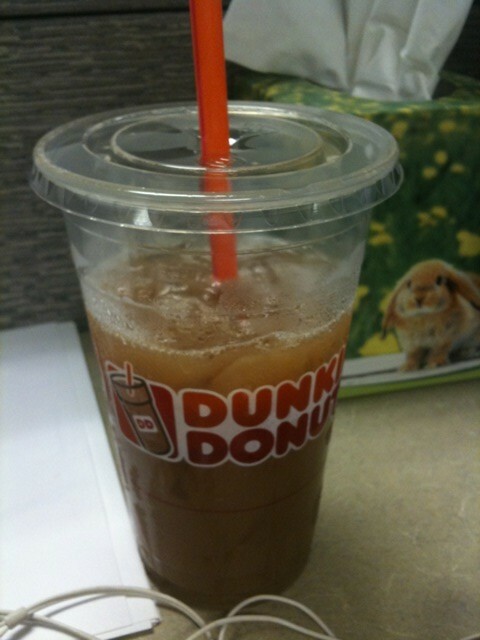 For breakfast I got a medium iced coffee from Dunkin Donuts (skim milk with sugar ... I am not a fan of fake sweeteners) and an egg white English muffin sandwich (they forgot the cheese). It was my turn to bring in breakfast for our little breakfast club. Every Friday it is someone else's turn. As a special treat I also brought in munchkins! 2 per person so I ended up with one glazed and one chocolate. At 60 calories per munchkin it is definitely a treat that won't happen again any time soon. Hopefully we get out of work early today ... I still need to do the legs/back and abs work out before going to Shari Sushi Lounge for happy hour with our friend Tonio. Happy friday! So my place of employment has decided to block my blog from the Internet. The nerve! Do they not know how important it is for me to jot down random thoughts at all times of the day? Do they not own an iPhone or other type of smartphone? Ha silly executives I will spend way more time attempting to blog from my phone than the time usually spent blogging from my outdated work computer. Way to negatively affect my productivity. Anyways I wanted to review Odwalla nourishing food bars. I tried the chocolate chip peanut flavor and was pleasantly surprised. 2 thumbs up! 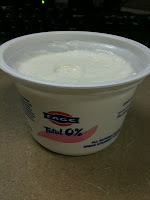 I had even taken 2 photos to use in this post but can't seem to figure out how to add them from my phone. Guess you'll just have to try one for yourself! I can't explain how tired I was all day yesterday. I don't think I realized how much I value sleep. On average I try to get at least 7-8 hours of sleep a night. 3.5 hours just does not cut it. I couldn't wait to leave work and just get home and fall asleep on the couch. Once I got home Ryan and I discussed dinner options. He knew I definitely was not planning on cooking anything so we opted for some Chinese take out from Empire Szechuan. Although not our healthiest option for dinner it was still delicious. We split fried rice and honey garlic chicken, cheese wontons, spring rolls, and some steamed edamame. When we finished eating our feast we watched some old episodes of Diners, Drive-ins and Dives that we had saved on our DVR. I must've fallen asleep after a couple of minutes cause Ryan woke me up and told me to just go to bed. I'm pretty sure when I looked at the bedside clock it was only 8:15pm. I missed out on yesterday's P90X work out (biceps and back, followed by abs) but I know that today I will definitely bring some energy while working out.